Praseodymium is a chemical element that haes the seembol Pr an atomic nummer 59. 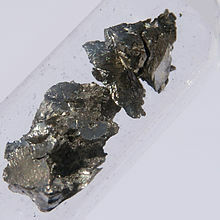 Praseodymium is a saft, sillery, malleable an ductile metal in the lanthanide group. It is too reactive tae be foond in native furm, an when airtificially prepared, it slowly develops a green oxide coatin. This page wis last eeditit on 8 Dizember 2013, at 16:39.